You put the lime in the coconut, you drink 'em both up. Ok, so limes haven't featured in Fortnite yet but if you've been following the recent updates then you'll know that several new consumable items have been added, including Fortnite Coconuts. These husky fruits behave like a mini Slurp Juice when used - providing a quick 5 boost to your health, rolling over to your shield if you have a full bar of health, which makes them somewhat more versatile than the Fortnite Bananas and Fortnite Peppers that were also added in the same update. If you want to tuck in to a Fortnite Coconut (fun fact: botanically they're actually a drupe rather than a nut) then follow our guide to their locations. 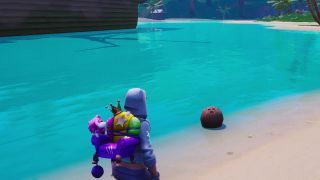 Fortnite Coconuts can be found in both the jungle and desert biomes, and are mainly concentrated around Lazy Lagoon and Paradise Palms. Although you'll sometimes spot them lying on the ground already, most of the time you'll need to destroy palm trees to dislodge them. These are the distinctive tall trees shown below, with a cluster underneath their leaves at the top of the trunk. Destroy them with your pickaxe, then listen out for the thud of a Fortnite Coconut landing nearby and grab it to give yourself a little health or shield increase.